Futsukaichi hot spring written in the oldest existing collection of Japanese poetry called Manyoshu, is located just 30 minutes away from Fukuoka city by car (app 15 mins by Japan Railway). And we can enjoy the scenery surrounded by nature at all seasons to prosper as Hakata’s drawing rooms for families. 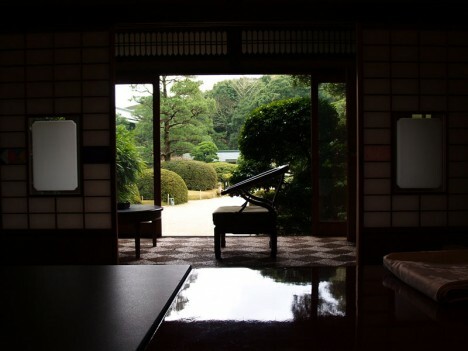 There are three guest room wings called “Taishotei”, “Heiantei” and “Showatei” which surround 11,550 square meters a Japanese garden in making an excursion style. The shoin style of traditional Japanese residential architecture Taishotei built of pure wood that the Emperor Showa has stayed, looks calm and settled and enables us to look at the Japanese garden. A four-story building Heiantei has Japanese gorgeous traditional tea-ceremony rooms. The rooms of Showatei are little bit smaller but there are bathrooms as well as other wings. Everyone including day trip visitors is able to enjoy monthly meals of dainty and refined Japanese dishes (reservation in advance) and a large bathhouse and room baths between 11:00 – 16:00 (Weekdays: 5,775 yen- / Weekends and National holidays: 9,240 yen-), 16:00 – 22:00 (All the time: 9,240 yen-). You will be given brilliant services including hot spring hotel and meals. 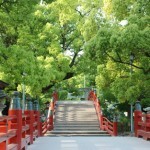 We hope you will spend time slowly there and visit many historic spots and facilities such as Dazaifu Tenmangu, the ruins of Dazaifu government office , Komyozenji which is only one temple having a garden formed Karesansui in Kyushu, Kanzeonji which is specified as a national treasure and an important cultural property.